Fetal Alcohol Effects (FAE) or Fetal Alcohol Spectrum Disorder (FASD) is an umbrella term used to describe the range of effects that can occur in an individual exposed to alcohol. These effects may include physical, mental, behavioral, and/or learning disabilities and can have life-long implications. Prenatal exposure to alcohol may cause disabilities that range from mild to severe. Whether it is a wine cooler, a glass of wine or a bottle of beer, any kind or amount of alcohol that a pregnant mother consumes is also being consumed by her unborn baby. The best cure is prevention and FASD is 100 percent preventable if a pregnant woman abstains from alcohol. FASD is the leading known cause of preventable mental retardation. FASD can occur anytime a pregnant woman drinks alcohol. Research has shown that drinking any alcoholic beverage is harmful, especially binge drinking (consuming four or more drinks on one occasion). Even a single binge during pregnancy has been associated with increased risk for learning disabilities in the newborn. Plain and simple- a pregnant woman should not drink alcohol. If you’re pregnant, don’t drink alcohol and if you drink alcohol, don’t get pregnant. There is no proven safe amount of alcohol during pregnancy. However, if you stop drinking at any time during the pregnancy, it will help the fetus. Drinking any kind of alcohol when you are pregnant can harm your baby, whether it is a 4-5 oz. glass of wine, a 12 oz. serving of beer or a 1½ oz. shot of distilled spirits (hard liquor) as all contain the same amount of alcohol. 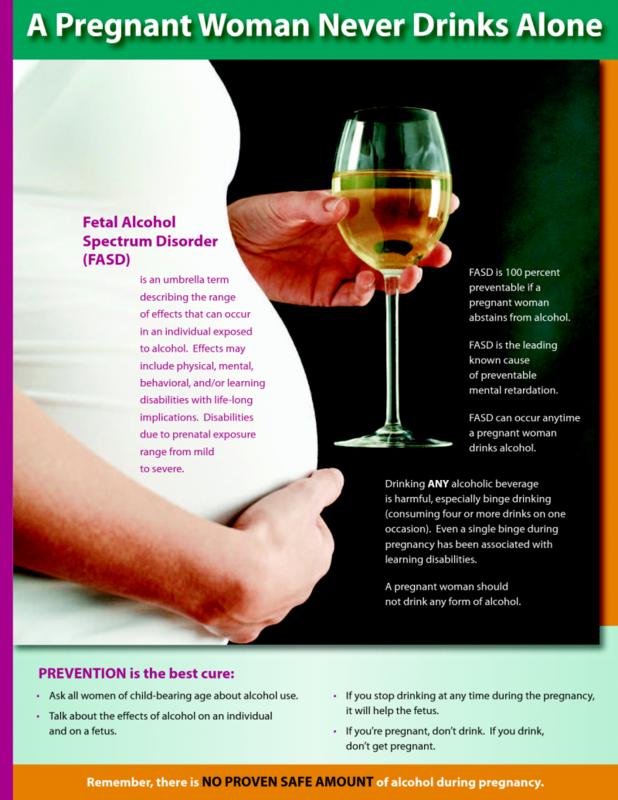 The easiest way to prevent FASD is to abstain from alcohol use during pregnancy. If a woman never drinks alcohol during pregnancy, her baby will not have problems from prenatal alcohol exposure. You don’t have to be a heavy drinker to have a baby affected by alcohol. If a pregnant woman drinks any alcohol, it passes directly from her bloodstream to the placenta of the growing baby. Drinking alcohol any time during pregnancy can cause Fetal Alcohol Spectrum Disorders (FASD) with life-long consequences.